One of the many new developments in Ipoh – The Enclave along Jalan Sultan Azlan Shah is sought after. IPOH: The prices of properties in Ipoh have skyrocketed in prime locations to be almost on par with those in Kuala Lumpur and Penang. “Ipoh is now bustling with activities. There is no sign of prices coming down,” said Oriental Realty agent Gladwin Agilan. Gladwin said the demand was not only for new developments but in the secondary market. Among the factors that have contribute to the upward trend in the demand for properties were better transport facilities including direct flights to Singapore, the electric train service, the state being an education hub and a high number of foreign companies investing in the state. Condominiums or high-rise apartments, once considered unprofitable, are now in demand as people look for amenities such as swimming pools, gymnasium, and restaurants at their doorsteps. The prices of properties in Canning Gardens have been increasing by 10% annually for the past three years. He said people chose to own properties in the area due to its location, which is near the city, and because of its freehold status. Gladwin, who is the head of the sales division, said the latest transaction showed the price of land was RM144 per sq ft for a single-storey semi-detached house. “Surprisingly these houses are purchased by Perakians who are in their late 30s to mid-40s. “Many of them have returned to their hometown due to better job opportunities. “Foreign companies such as Vale iron ore distribution centre in Teluk Rubiah have also created demand,” he said. The type of residential units being sought after has also changed. There is demand for condominiums, gated-and-guarded landed properties as well as properties that have easy access to amenities. 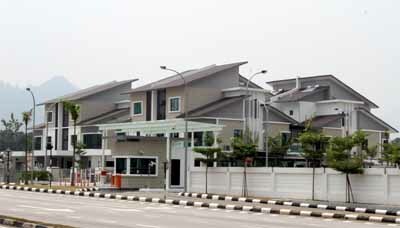 Gladwin said new developments such as the Haven Lakeside Residences in Tambun, Meru Hills in Meru Valley and The Enclave along Jalan Sultan Azlan Shah, Somerset at Thompson off Jalan Sultan Azlan Shah, Casa Bintang near the Ipoh Swimming Club in Jalan Raja Dr Nazrin Shah, were gaining popularity. He added that developments were now taking place in the outskirts such as Klebang, Kledang, Pasir Putih and Sunway in Tambun. Gladwin said the perception of owning a property in Ipoh, and not being able to rent out was incorrect as the demand for rented housing was overwhelming especially in Meru Valley and the Sunway area. “Foreigners working in the state prefer to stay in bungalows or condos in such serene areas. “It offers a higher yield of between 7% and 10%, which is considered good, as only commercial properties offer such attractive returns,” he added. He said besides Ipoh, the next upcoming market is Manjung, located about 90km from the city. Other potential areas for development included Lumut, Teluk Batik and Pangkor. Another real estate agent P.Ranganathan agreed that the prices of properties were going up in certain parts of the city. He said the prices of property had increased by up to 30% in the last three years. “Those that have made up their mind to purchase properties in the city should do so fast as the prices of building materials are increasing. “With steel bars and other building materials on the rise, the prices of properties are also expected to increase,” he added. Datuk Bandar Datuk Roshidi Hashim said the skyline of Ipoh would change by 2014. He said this was visible from the rapid development that was taking shape in the city. “We are expecting more development to take place in the city,” he said. Are there too many malls in Penang?